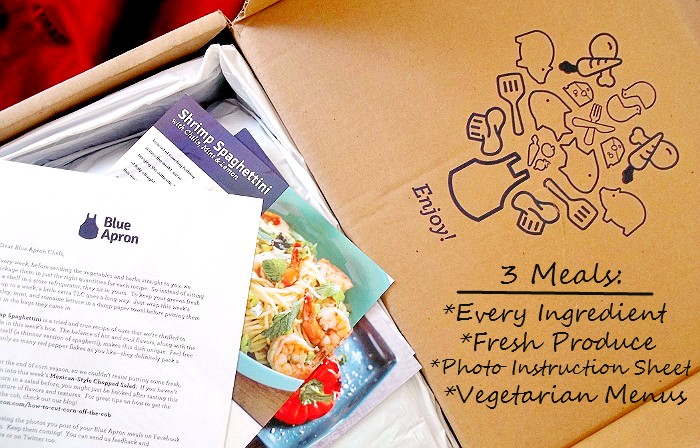 ****I received a 3 meal, 1 week, trial of Blue Apron Meals for the purpose of this series. No further compensation was provided. All photos contained below are property of Momma Told Me Blog 2013. Momma Told Me: There's more to eat than candy and cake! I'm not going to lie, Blue Apron Meals is my new crush and I am absolutely smitten, folks. For those of you just joining the final part in this series, Blue Apron is a revolutionary new 'to your door' service that inspires chefs from beginner to professional to hit their cutting boards and explore new recipes. Structured as an elective weekly delivery program, Blue Apron will send every single ingredient you need to make 3 deliciously inspired meals in the comfort of your own home. That's everything from seasonal fresh produce to spices and protein- all carefully measured to create portions in groups of 2. You'll not only receive a carefully packed box of ingredients, but a beautiful, full color, recipe card with photo enhanced step-by-step preparation instructions for each meal. The only thing missing is the blue apron, itself! The first two posts I featured my first attempt at Stuffed Peppers with Millet and Mexican Style Chopped Salad; for my final meal, I was presented a more simplistic Shrimp Spaghettini with Chilis, Mint, and Lemon. In my original shipment I had received a carefully packaged 10oz portion of fresh de-veined shrimp- unfortunately, this package had become punctured in shipping, so I replaced the shrimp on my own. With everything else in ship shape condition, I hit the cutting board to dice my shallot, garlic, and sweet Italian pepper. While I love to cook, I'd never be able to discern a 'sweet Italian pepper' from the lineup at my local grocer, so this was yet another case where Blue Apron had instantly expanded my culinary horizons. 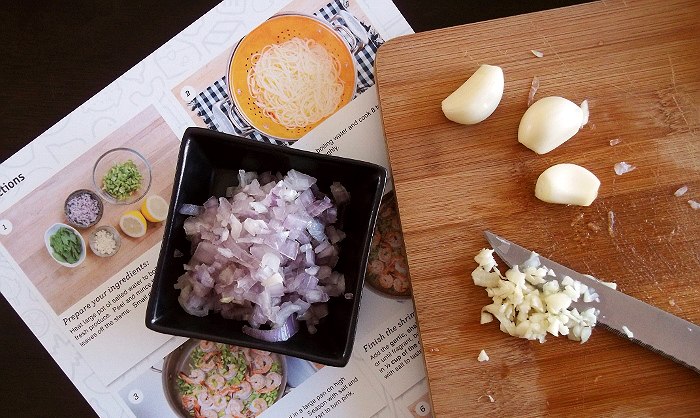 From prep-to-plate, my cooking endeavors took no more than 15 minutes, using the photo guided instructions given to me. 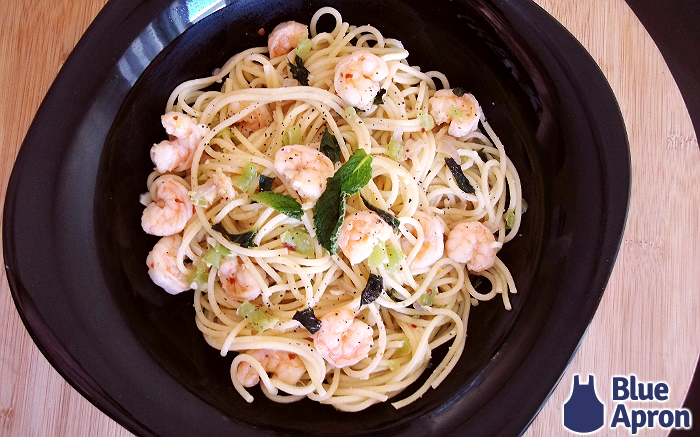 For tips on how to cook pasts just right, and tell when shrimp is done, I utilized the community on Blue Apron for feedback from other customers and budding chefs. Once my ingredients had been properly cooked and sauteed, I plated my dish and tore up some of the fresh mint leaves to garnish (another first for me). The entire recipe felt so simple I was, honestly, anticipating a more bland dish that needed extra seasoning to really stand out. I was ever wrong; this dish was full of fresh seasonal flavor that continued to present itself with each bite, and even built itself to a pleasant heat by the last noodle. The other half is not much of a shrimp lover, but I was surprised to learn he had dug out the remaining cooked pasts to enjoy for an afternoon meal one day. Even Jay was impressed by the flavor of a pasta dish with no visible sauce! 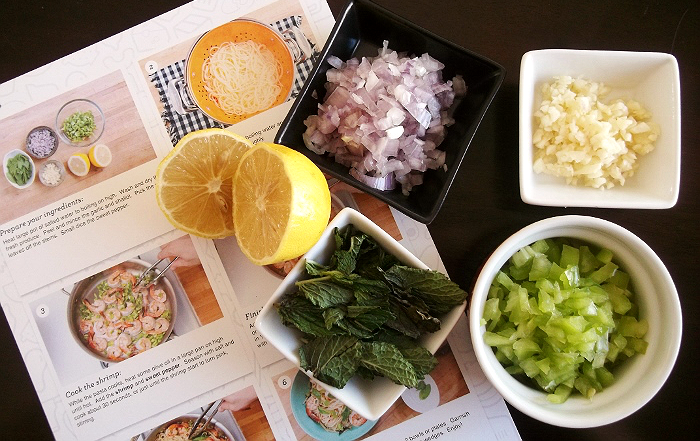 The delicate balance of hot red pepper flakes and cool mint offers a culinary pairing I never would have dreamt of on my own and shows how Blue Apron had once again expanded my culinary horizons. The true hero in this dish, however, were the fresh ingredients that brought out the natural flavors of a home cooked Italian meal, the perfect pick for an early Fall afternoon. We have been tickled with our Blue Apron experience- many of the portions were bigger than we'd expected, and we often had leftovers for the following day, making the $10/person price tag a bargain. 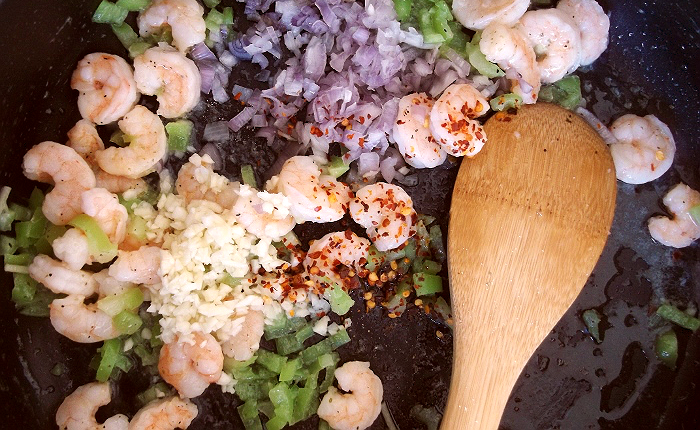 Not only are customers receiving freshly packed ingredients and recipes that save them time, but Blue Apron is an opportunity for culinary growth. While you may preview the upcoming week's dishes before buying your box, there is only a vegetarian customization option. This may be a setback for some, but to me it is one of the main draws. 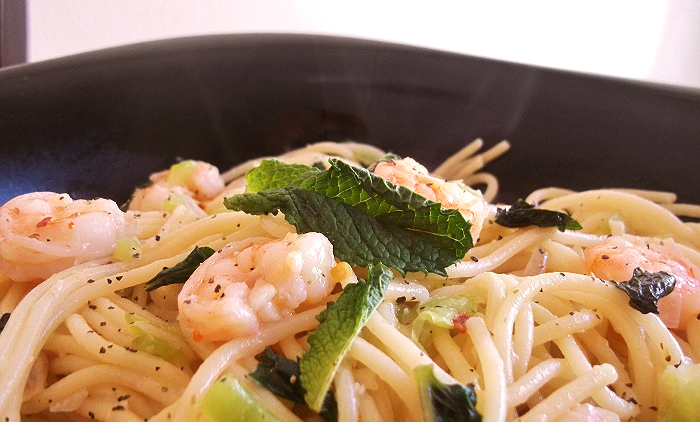 I just love trying new dishes and, even better, being able to say I made them at home! 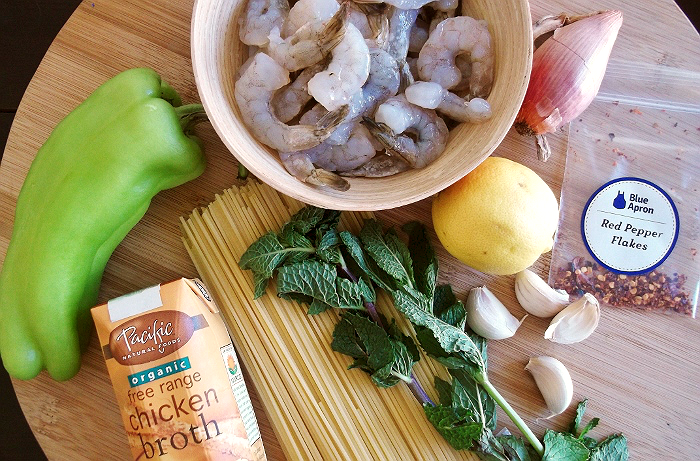 What Daughter Says: Cook outside your comfort zone and discover new favorites with Blue Apron! 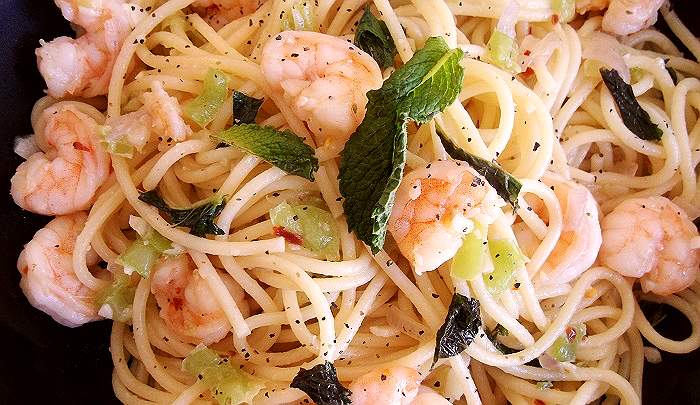 Oh my shrimp is one of my weaknesses and that does look so good! Another great meal! I bet your family is all smiles at dinner time!